Game not over? 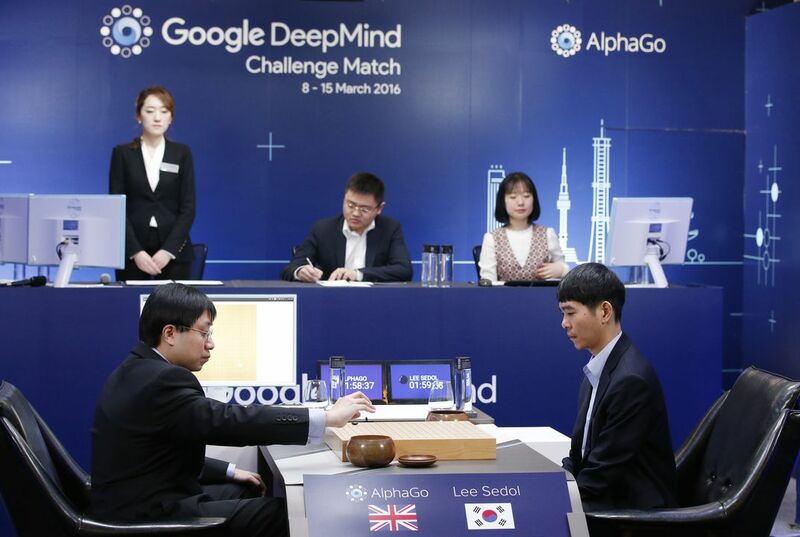 Human Go champion Lee Sedol says Google's Go-playing program AlphaGo is not yet superior to humans. That is despite its victory in a match that ended March 15. 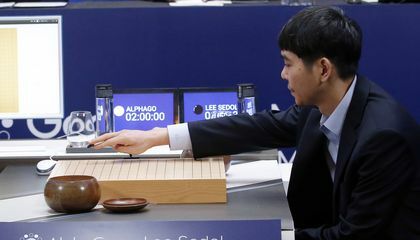 The week-long showdown between the South Korean Go grandmaster and Google DeepMind's artificial intelligence program showed the computer software has mastered a major challenge for artificial intelligence. "I don't necessarily think AlphaGo is superior to me. I believe that there is still more a human being could do to play against artificial intelligence," Lee said after the nearly five-hour-long final game. AlphaGo had the upper hand in terms of its lack of vulnerability to emotion and fatigue. They are two crucial aspects in the intense brain game. "When it comes to psychological factors and strong concentration power, humans cannot be a match," Lee said. But he added, "I don't think my defeat this time is a loss for humanity. It clearly shows my weaknesses. But not the weakness of all humanity." He expressed deep regret for the loss and thanked his fans for their support. He said he enjoyed all five matches. He was beaten in four. Lee, 33, has made his living playing Go since he was 12. He is famous in South Korea. He is famous even among people who do not play the game. The entire country was rooting for him to win. The series was intensely watched across Asia. The human-versus-machine battle hogged headlines. The final game was too close to call until the very end. Experts said it was the best of the five games. Lee was in top form and AlphaGo made few mistakes. Lee resigned about five hours into the game. The final match was broadcast live on three major TV networks in South Korea. It could be watched on big TV screens in downtown Seoul. Google estimated that 60 million people in China, where Go is a popular pastime, watched the first match. Before AlphaGo's victory, the ancient Chinese board game was seen as too complex for computers to master. Lee is one of the world's best players. Fans across Asia were astonished when he lost the first three matches. Lee's win over AlphaGo in the fourth match showed the machine was not infallible. Afterward, Lee said AlphaGo's handling of surprise moves was weak. The program also played less well with a black stone. It plays first and has to claim a larger territory than its opponent to win. Choosing not to exploit that weakness, Lee opted for a black stone in the last match. Go players take turns placing the black and white stones on 361 grid intersections. The game is played on a nearly square board. Stones can be captured when they are surrounded by those of their opponent. To take control of territory, players surround vacant areas with their stones. The game continues until both sides agree there are no more places to put stones. Or they play until one side decides to quit. Google officials say the company wants to apply technologies used in AlphaGo in other areas, such as smartphone assistants, and ultimately to help scientists solve real-world problems. As for Go, other top players are bracing themselves. Chinese world Go champion Ke Jie said it was just a matter of time before top Go players like himself would be overtaken by artificial intelligence. "It is very hard for Go players at my level to improve even a little bit, whereas AlphaGo has hundreds of computers to help it improve and can play hundreds of practice matches a day," Ke said. "It does not seem like a good thing for we professional Go players, but the match played a very good role in promoting Go," Ke said. How could a machine make mistakes? Alphago is a program so it can't think about other ways which is not programmed. Also, Lee sedol put the stones in crazy places to make Alphago confused. I think this is the reason that Alphago made mistakes. Machines can't think like humans. So, if the oppenent change the way to play go, machines can't predict. But they learn the way. Human player has to play go every differnt way while playing then. Becuase of manchine's learning, machine can be predicted but not human. Machine could make mistakes. Because, the machine can't think like human. So they can't think what will happen to them. A machine could make mistakes if they get a move they are not expecting. It is likely that a machine thinks of many possible moves the opponent may make, and set up alternatives for those moves. But if the opponent makes a move that is not expected, then it will possibly make a mistake. They can't think like humans. And if we change the pattern that computer don't know, I think computer will do some mistake, because computer don't know what they have to do in that problem. Obviously machines cannot surpass the human mind. Machines can only perform what we program them to do. A machine has a lot of ways it can malfunction so it be a power outage or a physical restrain. I agree man is more powerful and efficient than a machine. Human created and programmed the machines, so all of their functions are codes, not independent thinking like humans.